1 Preheat oven to 180˚C, gas mark 4. Heat the sugar in a pan until it starts to melt, stirring gently to evenly caramelise the sugar. 2 Once golden brown, carefully whisk in 50ml water over a low heat until caramel has fully dissolved. Pass through a sieve and leave to cool for 2-3 minutes. Then slowly whisk in the butter and the vanilla, once all incorporated, keep to one side. 3 Warm the butterscotch in a 30cm pan, place the apples and vanilla around the pan. 4 Roll out the pastry to a 32cm circle, place on top of the apples and tuck the edge of the pastry in. Sprinkle with caster sugar on top. 5 Place into the oven and bake for 25-30 minutes, until golden brown and crisp. Take out of the oven and leave to rest for 5 minutes. 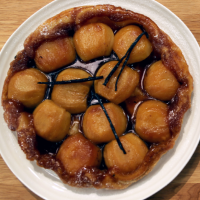 Turn out the tarte tatin, remove the vanilla pods and lightly dust with icing sugar. Whisk the ground cinnamon into the crème fraîche and serve with the tarte tatin.